This book joins with Unit Operations in Food Processing and Fundamentals of Food Reaction Technology in presenting systematic food technology. In this case, it is product technology which integrates processing and marketing technologies. Systematic product technology has been found efficient and effective in developing new products across the food industry. Food product development is based on the company and its environment and therefore it varies from project to project but there is a basic structure that is the fundamental Product Development Process. This can be used as a framework for the activities in any project. The outcomes from the activities build up to provide the knowledge for the decisions to be made by top management at the critical points in the project. The project manager decides on the techniques to be used in the activities. So there is a flow from activities (techniques) to outcomes to decisions, and then back to activities and techniques selection. The activities and decisions are related to the company’s knowledge and resources, the product’s level of innovation, technology and consumer involvement, the risk-taking philosophy in the company and the level of scientific and technological knowledge available generally. The book has numerous think breaks, examples and case studies to widen the reader’s knowledge of product development across various areas of the food industry – consumer, service, industrial, primary agricultural/marine, in other words throughout the food chain from the land and sea to the consumer’s plate. There are also project breaks, which suggest the activities which could be taking place at that point in the project, and projects are described for those people who do not have industrial contacts. This book is neither a review of published literature on product development nor a detailed quantitative textbook of techniques; it is only an introduction to the product development project so that people can build a general knowledge which can be a basis for further study using the textbooks listed at the end of the book. It is encompassing, and can be used by people in either the technical or marketing areas in the company – best in groups. It is hoped that it will encourage the readers to work in this multidisciplinary, creative and ever-changing area of technology. In the book, the Product Development Process is divided into four parts that follow each other – product strategy development, product design and process development, product commercialisation, product launch and evaluation. There is some emphasis on building the product strategy as it is important to have a clear definition of the product concept, the product development plan, the project aim and that there is technical and marketing acceptance. The top management for their decision making can assess the conformity with the business strategy, the availability of time and costs, and the probability of success. The book was based firstly on experience in the food industry in Britain and New Zealand which was used to develop food product development courses at Massey University. Students cooperated in product development projects with companies in the New Zealand food industry. The material in the book was further developed in workshops held in New Zealand, Australia, Singapore, Thailand and Canada. 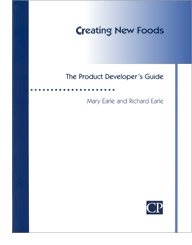 The authors are grateful to product development staff and students in the Food Technology Department and the Food Technology Research Centre at Massey University, New Zealand, who built up the knowledge in this book over 30 years; and also those in five Thai universities who built product development courses and worked cooperatively with the Thai food industry. © 2000 Chartered Institute of Environmental Health. Reproduced with the kind permission of the Chartered Institute of Environmental Health, UK. Creating New Foods. The Product Developer's Guide, the Web Edition, 2009. Authors: M.D. Earle and R.L. Earle.